Undo It! 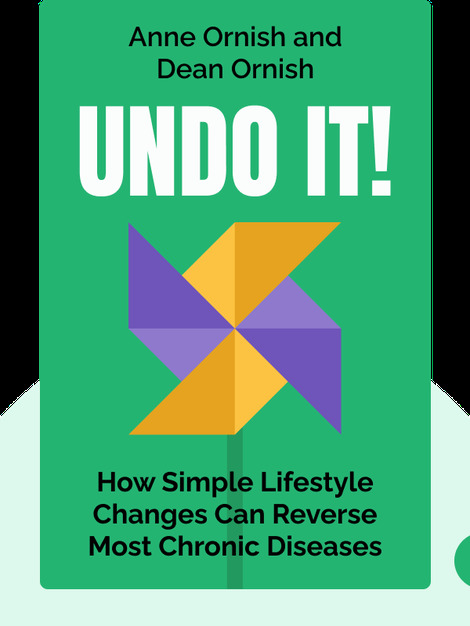 (2019) reveals the astonishing power of making simple lifestyle changes that can not just prevent, but even reverse a wide range of chronic diseases. That might sound like wishful thinking, but it’s backed by a rich array of research that has been published in peer-reviewed scientific journals and reflects a growing consensus within the mainstream medical community. Dr. Dean Ornish is a clinical professor of medicine at the University of California, San Francisco, and the University of California, San Diego. His research has been published in leading peer-reviewed medical journals such as the Journal of the American Medical Association, the New England Journal of Medicine and the Lancet. He is the author of six bestselling books, including Dr. Dean Ornish’s Program for Reversing Heart Disease (1990) and The Spectrum (2008). 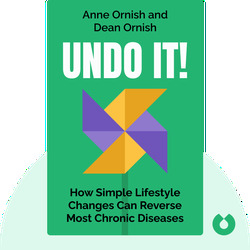 Anne Ornish is the vice president of program development at the Preventive Medicine Research Institute, which investigates how diet and lifestyle affect health and disease. She is also the digital director of Ornish Lifestyle Medicine – an organization that offers a nine-week lifestyle medicine program implemented by hospitals, clinics and physician groups around the United States.